At this time of year broccoli really comes into its own. You’ll often see a heaping mound of it at the market or greengrocer’s and that’s when you want to snap it up: pert, verdant, locally grown, bursting with goodness and offering a whole heap of possibilities. Yep, that’s when you want to ROCK THE BROC! Thankfully, someone worked out that the enemy of picked broccoli was the heat stored in its stem. After harvesting the heat dissipates slowly, especially in hot weather, hastening the vegetable’s decay. These days broccoli is cut and trimmed in the field, packed into crates then chilled to lower the core temperature to under 2°C, or about 35°F (when picked the internal temperature of broccoli can be as high as 24°C – about 75°F) – all within a short timeframe of 2 hours. The broccoli is put through a liquid ice water bath and ice and water are injected into the crates for 60-90 seconds. No chemicals, no preservatives, just a quick dip in freezing water. You’d cool down quickly, too, if they did that to you! The result with broccoli is a product which retains more of its nutrients and keeps fresher for a longer period, even through summer. It goes without saying then that what you are looking for is spanking fresh broccoli, and you should be able to get it. It should feel taught and be weighty for its size, the heads should be compact, not open, and it should be free from odour. The colour will vary from dark green to bluey green for common broccoli (Calabrese), and a brighter lime green for the pointy-tipped variety known as Romesco. There is also a purple variety, which is usually just called purple broccoli! It tends to have smaller heads than Calabrese but the taste is similar. Use the leaves in cooking when you can, too, as they are just as nutritious as the stems. The same set of rules applies to broccolini – the stems should be firm, not bendy, with the florets showing no sign of yellowing. If you are not using broccoli immediately, transfer to an open plastic bag (don’t seal it) and keep refrigerated. What we can be sure of is broccoli’s goodness. If you find it a tad ho-hum when foodwriters rattle off which vitamins and health properties are to be found in certain foods, just rest assured that when it comes to broccoli you are eating a lifesaver. It’s that good. Antioxidants. Tick. Fibre. Tick. Folate, iron, calcium, potassium. Tick. Carotenoids. Tick. Phenolics. Tick. And claims that broccoli can help prevent some cancers is no longer anecdotal so just eat it up, the more the better. Of course, it must be fresh – old broccoli will be depleted of its goodness and is only good for the compost. And the stems should be eaten too – they contain more vitamin A than the flowers. They may need peeling, but they can be turned into a tasty purée and served separately to the florets. 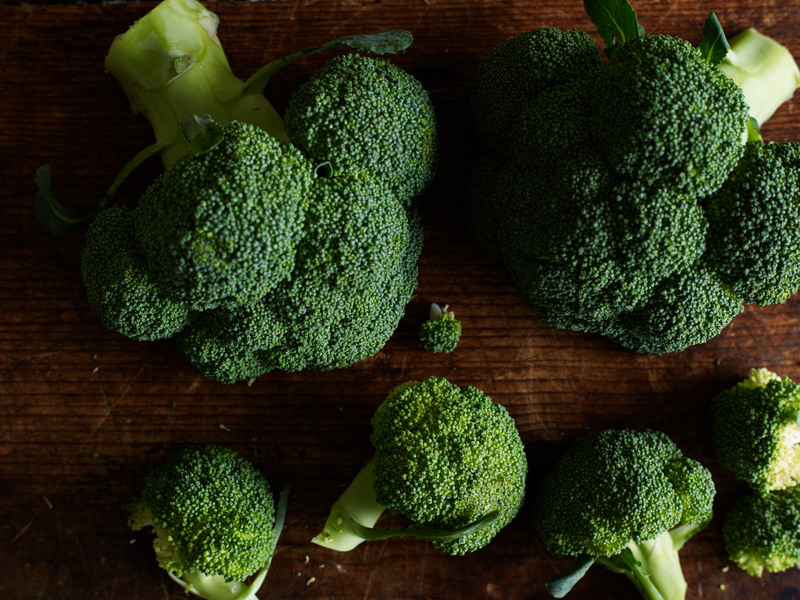 Remember that cooked broccoli does not stay hot for long, so transfer it to a heated dish, and serve immediately. Alternatively, cook it briefly in boiling salted water, drain, refresh with cold water, then plunge it into a bowl of icy cold water to immediately cool it. Drain, gently shake, then dry off on paper towels. Before serving, heat it gently in a little butter or olive oil, adding seasonings, and the minute it is piping hot, transfer to a heated plate and get it to the table. Never cover cooked broccoli with a lid because when you remove the lid it will stink and put everyone off dinner. True! Broccoli seems to have an affinity with garlic, and simply tossed in garlicky oil is a great way to get a double dose of goodness considering garlic’s antibacterial, antiviral and anti-cancer properties. It also takes to pungent flavourings like ginger and chilli, likes tangy ingredients such as capers, acidic tastes like vinegar and lemon juice – although these should be added at the last minute otherwise they’ll cause the broccoli to lose its nice bright green colour – and salty ingredients like parmesan cheese, soy sauce and anchovies. Then there’s nutmeg, black pepper, sea salt, black olives, extra virgin olive oil, and dairy: camembert melted over broccoli sprigs, broccoli with cheese sauce, broccoli tossed in browned butter… Broccoli happily marries them all! I really enjoyed the brocolli, steamed and then tossed in oil with garlic and parmesan. But I must remember not to leave the lid on the broccoli after it is cooked – as you warned it stinks when you take the lid off! Luckily, only I was in the kiktchen. Thanks for all the tips. Good one Prudence. I’m glad you enjoyed it with garlic and parmesan. Shiny and green, sweet and crunchy, here's an easy midweek broccoli dish.